Now more than ever our state needs reliable, transparent journalism. There’s no better way for the public to make sense of complex ballot measures and hold the powerful accountable. 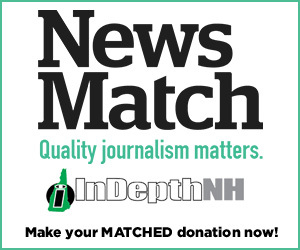 InDepthNH.org has been providing this type of reporting for more than three years, but we can’t tell these stories without the support of readers like you. From now through Dec. 31, NewsMatch will match your new monthly donation 12x or double your one-time gift, all up to $1,000. Will you donate now to help us raise $50,000? The New Hampshire Center for Public Interest Journalism is the only nonprofit news outlet in the state that is eligible for this special project.